This soap looks like it was difficult to make but is actually very easy. 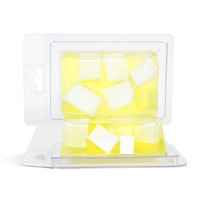 This is a great soap for selling at craft shows because the clamshells make for a stylish and easy packaging idea. Just put the back on, label and you are ready to sell. The use of a clamshell allows for safe shipping and eliminates labor associated with packaging. Place clamshells on jelly roll pans for stability. To large mixing bowl, add White Soap that has been cut up into small chunks. Set side. 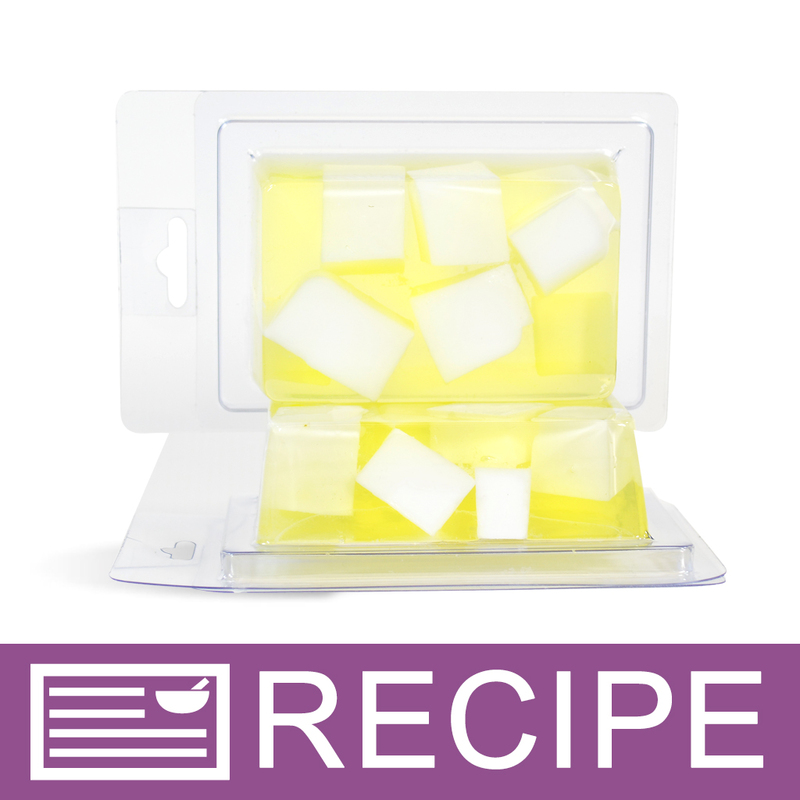 To microwave-safe bowl, add cut up Clear Soap and yellow color block. Heat in microwave until melted. Mix Fragrance Oil and Stabilizer together in beaker and allow to sit for at least 2 minutes. Add to melted soap and stir. Pour the soap into the clamshells filling them half way full. Thoroughly spritz the chunks of white soap with rubbing alcohol. 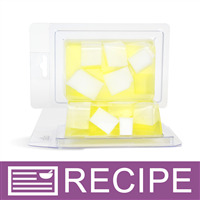 Place cubes of soap into the clamshells. Add enough cubes until the cavities are filled. Spritz with rubbing alcohol. Let soap completely harden and place backs on clamshells. Ingredient Label: Propylene Glycol, Sorbitol, Water, Sodium Stearate, Sodium Laureth Sulfate, Sodium Myristate, Sodium Cocoyl Isethionate, Glycerin, Titanium Dioxide, Yellow 5, Diazolidinyl Urea, Methylparaben. "Would I be able to use Lemon Verbena Fragrance instead of the Lemon Sugar Soap? " Staff Answer Yes you can. You will need to make sure that the Lemon Verbena Fragrance oil is safe to use in the same amount as the Lemon Sugar in our recipe. We recommend testing all substitutions in a small batch before making a larger batch for retail. You alone are responsible for product and recipe testing to ensure compatibility and safety. If selling, you would need to change the INCI ingredient listing to reflect any substitutions or changes to our original recipe.